For Groups of 20 + we will require a further 15% booking deposit from the group. In the event of a no show without adequate notification of 4 weeks notice we will charge for the entire value of the booking. A security deposit of 100 euro for non agent bookings will be charged on arrival but it will be returned provided that no damage has being incurred. 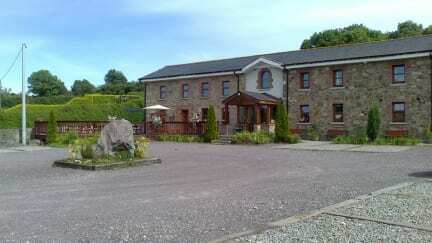 Newgrange Lodge is set in stunning landscape with wonderful views all around this heritage site. Only 30 minutes from Dublin airport our well appointed, quality accommodation provides an excellent base from which to explore the Boyne valley and beyond. All of our rooms will soon be equipped with wireless internet access, in-room telephones and satellite television to complement the comfortable furnishings in the bedrooms and ensuite bathrooms. We provide double, twin, family rooms and larger dormitory accommodation for groups. We also have a fully equipped kitchen/dining area to cater for your complimentary breakfast as well as dinner if required. We will even provide you with a packed lunch for your days out exploring this fascinating part of Ireland ( we would require advance notice for this service). Relax and reflect on 5000 years of local history or indeed the day's exertions in our sitting room with views of nearby Newgrange. Swap tales of your exploits with like minded travellers. With free internet access and inexpensive transfers to Drogheda, which connect to the main bus and rail routes in the country, access into and out of Newgrange is simple and close to Dublin. There is also direct shuttle transfers to and from the lodge. Perfect if you wish to witness the hustle and bustle of one of Europe's finest cities during the day and unwind in quiet, stunning countryside in the evening or possibly for the rest of the week. Parking for camper vans available on site for a small fee - charge your battery and fill up with water while exploring the area. Free Bike Hire and luggage storage to guests at Newgrange Lodge. Direct shuttle service from Dublin City to Newgrange Lodge. Super toll. Es gibt sogar eine kleine Küche, zwar nicht perfekt ausgestattet, aber für z. B. Nudeln mit Soße reicht es allemal. Guter Preis für Schlafsaal mit Bad im Zimmer. Gemütliche Lounge und TV Bereich mit Sofas. Ein "kleines" Frühstück ist inklusive. Dies war dann mit Toast, Müsli, Schinken, Eier, Obst, Tee und Kaffee, etc. Liegt auch sehr nah an vielen Sehenswürdigkeiten, also denke ich gut geeignet als Ausgangspunkt. Very nice place to stay. Not far away from Dublin airport. Fantastic view at Newgrange. Good breakfast. Very kind staff. Really good breakfast, nice common rooms. Newgrange visitor center is just across the road, so this is the perfect accommodation if you want to go there. But you need a car to get there as the hostel is located outside of town.